Photokina 2014, here we come! From September 16 to 21, the charming German town of Cologne will host Photokina 2014, the world’s leading imaging fair that every two years brings together the industry, trade, professional users and photo enthusiasts to announce the most amazing innovations in the field. Expectation grows daily, not only for exhibitors such as Canon, Nikon, Zeiss and Fujifilm, which will present to the world their new DSLR cameras and lenses, but also for b-grip! During Photokina 2014 we are launching a new product, in addition to our innovative line of fully compatible camera accessories. To know all the news and market rumors or get more information, please visit Photokina 2014 website or come and see us! 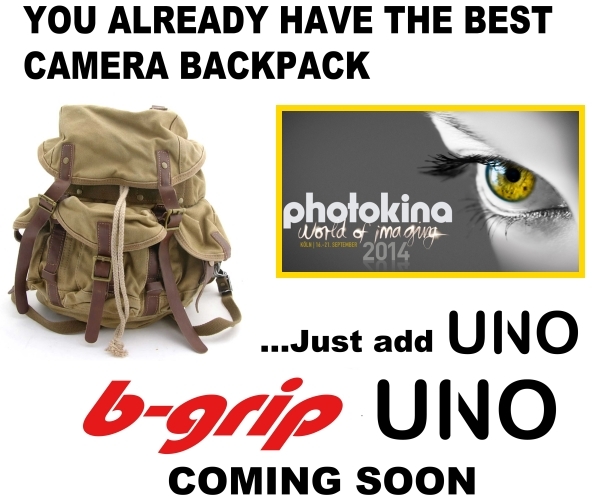 We will introduce our new b-grip UNO! Visit us at hall 2.1 booth C 030!